stand by an alligator killed by a Texas Game Warden near Carrizo Springs, Texas. A big alligator was crossing a road near Carrizo Springs, Texas when it was struck by a passing car. 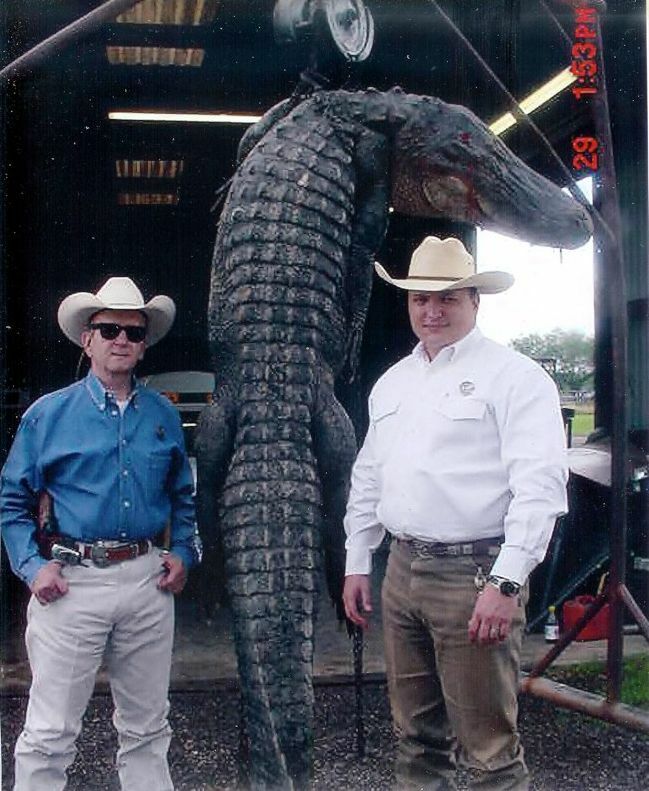 The gator's head was injured and the animal was later killed by a Texas Game Warden. The alligator was close to the state record in length. Texas alligators can measure over 13 feet, and weigh over 800 pounds. According to the U.S. Fish and Wildlife Service, the original range of the alligators extended as far north as New Jersey, southward to the South Atlantic and Gulf Coasts, inland to the confluence of the Arkansas River with the Mississippi River and westward to the 100th meridian in Texas, which is the eastern boundary of the Texas panhandle. Alligators were depleted from many parts of their range as a result of hunting and loss of habitat. Today, the alligator's range extends east to the Carolinas, west to Texas and north to Arkansas. The Endangered Species Act prohibited alligator hunting, allowing the species to come back to many areas where it had been depleted. Shortly after their protection began, alligators rapidly repopulated areas that were once heavily hunted. As the alligator began to make a comeback, states established alligator population monitoring programs and used this information to ensure alligator numbers continued to increase. In 1984, after 15 years of protection, Texas began harvesting wild alligators through a carefully monitored program. In 1987, the Fish and Wildlife Service pronounced the American alligator fully recovered and removed it from the list of endangered species.